Kellyanne Conway Urges Shoppers To Buy Ivanka Trump's Products, Raising Ethics Questions : The Two-Way Her comments appear to violate ethics rules barring federal employees from seeking to profit from their positions. White House press secretary Sean Spicer said later that Conway had been "counseled." 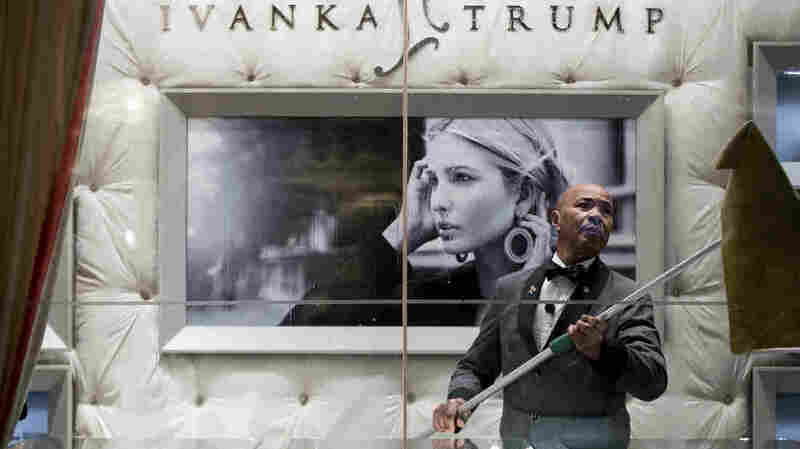 A worker cleaned the windows of the Ivanka Trump Collection in the lobby of Trump Tower in New York last month. Kellyanne Conway, a top adviser to President Trump, may have violated federal ethics rules Thursday when she urged shoppers to buy Ivanka Trump's retail brand, following the decision by several retail companies to drop the line because of poor sales. "Go buy Ivanka's stuff, is what I was [saying] — I hate shopping and I'm going to go get some myself today," Conway said in an interview on Fox & Friends. "This is just [a] wonderful line," she added. "I'm going to give a free commercial here. Go buy it today, everybody. You can find it online." Her comments drew sharp criticism from the chairman of the House Oversight Committee, Republican Jason Chaffetz. "That is absolutely wrong, wrong, wrong. It is over the top," Chaffetz told reporters. Chaffetz and the committee's ranking minority member, Democrat Elijah Cummings, asked the U.S. Office of Government Ethics in a letter to determine whether disciplinary action should be brought against Conway. "Conway's statements clearly violate the ethical principles for federal employees and are unacceptable," the letter said. "In this case, there is an additional challenge, which is that the President, as the ultimate disciplinary authority for White House employees, has an inherent conflict of interest since Conway's statements relate to his daughter's private business," it said. White House press secretary Sean Spicer said Thursday that Conway had been "counseled" over her remarks. Conway, interviewed later Thursday, again on Fox, said she would have no comment on the counseling but had "spent an awful lot of time with the president of the United States this afternoon and he supports me 100 percent." Federal ethics rules bar executive branch employees from profiting off their positions, but the statute exempts the president. Conway, however, is a White House employee, and her comments urging people to buy the products appear to violate the rules, says Kathleen Clark, professor of law at Washington University in St. Louis. "The broader rule is that government employees shouldn't use public office for private gain. They shouldn't use it for their own personal private gain or for somebody else's private gain. Public office should be used for the good of the public, for the good of the country, for the good of the government, rather than singling out her boss's daughter's enterprise and encouraging people to shop Ivanka." Clark also noted that Trump's tweet Wednesday about his daughter was retweeted by someone from the official White House account @POTUS. "That was a violation of the ethics regulation if it was done by anybody other than the president or the vice president. But even if the president himself did that, it was improper, because there he is using a government resource for his own personal vendetta," she said. Meanwhile, the progressive group Public Citizen urged the U.S. Office of Government Ethics to investigate whether Conway's comments violated the rules. "Anyone harboring illusions that there was some separation between the Trump administration and the Trump family businesses has had their fantasy shattered," said Robert Weissman, the organization's president. "Kellyanne Conway's self-proclaimed advertisement for the Ivanka Trump fashion line demonstrates again what anyone with common sense already knew: President Trump and the Trump administration will use the government apparatus to advance the interests of the family businesses." In the Fox interview, Conway suggested retailers are dropping the line because of politics. "They're using her, who's been a champion for women in power and women in the workplace, to get to him. I think people can see through that," she said. 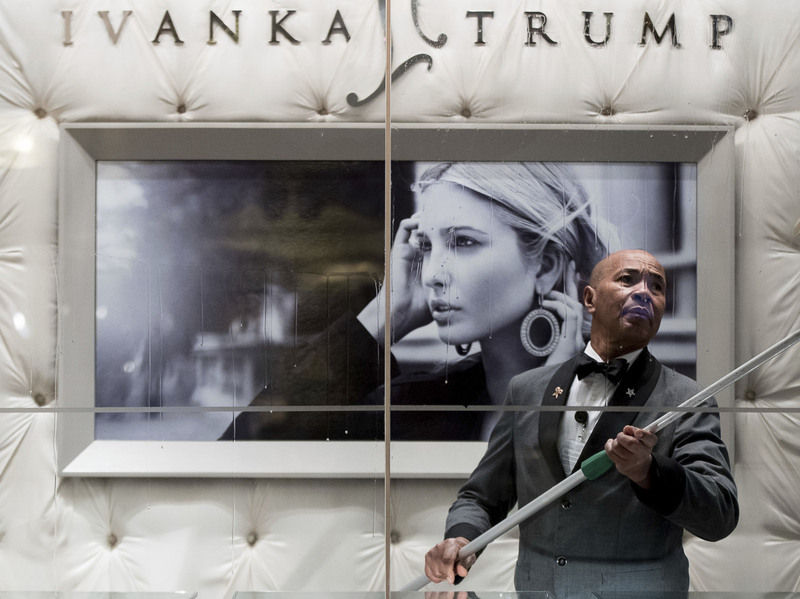 T.J. Maxx and Marshalls told employees last week to stop using signs promoting Ivanka Trump's brand and mix in her products with others the store sells to make them less prominent. Nordstrom has also said that it would no longer sell Ivanka Trump jewelry and clothing because sales have been disappointing. Neither the company nor Ivanka Trump's brand released any sales figures. The line is still carried by other retailers. After Nordstrom's decision, President Trump himself tweeted that his daughter "has been treated so unfairly" by the chain, and his son Donald retweeted an article Thursday about angry store customers cutting up their credit cards. It's not clear how shoppers will react to the clothing controversy. Outside a Marshalls store in Washington, D.C., a housewife from Argentina wasn't impressed by all the controversy. "If I like it, I buy it. If I don't, I don't," said Andrea Ponzio, 47. "It doesn't mean I wouldn't buy it because of any politics."